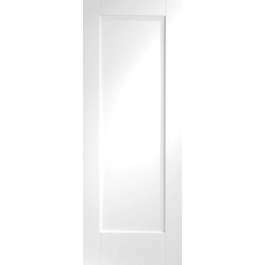 44mm engineered FD30 fire rated internal white door with a single large recessed panel. Supplied white primed (double coated), ready for on-site finishing. Available in standard imperial sizes with 10 year manufacturing guarantee. Large, flat panel and traditional stiles and rails make for a simple, contemporary look of this door. Designed to match the popular kitchen and furniture ranges and produced in an extensive range of sizes. With a vast number of matching glazed, non-fire rated, oak, external and even bi-fold and folding doors, this door style offers unrivaled flexibility to homeowners.